Your purchase at The Infinite Attic ships tomorrow! now available at our family eBay store, The Infinite Attic. and (blush) to keep closer tabs on inventory. Black Book Band Tees: Brain Weasels Tour | Heaven & Earth Tour New images! Can't find what you were looking for? Drop me a note. 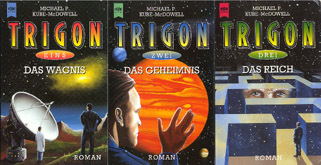 Set of three large paperbacks. 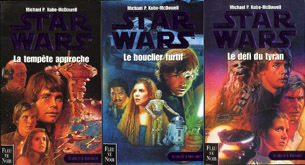 All editions are out of print in the United States. See also the limited edition Exile t-shirt, below. All out of print. All new and unread, most mint or near-mint. Quantities limited. 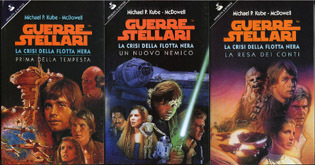 Baen Books edition, 1985 / Paperback / Definitive version of "Winter"
All copies at least very good. Some bear small signs of their long journey from the publisher to my hands, in the form or a bump here, a crease there. 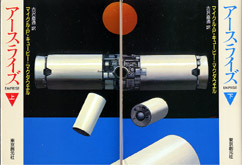 Original graphic art by the author showing the Arch of the Thirteen Bells in Ana. Black print (one side) on light grey fleck 50/50 tee. Just three left! A wearable collectible. Sizes as listed. To see a closeup image of the T-shirt design, click here. 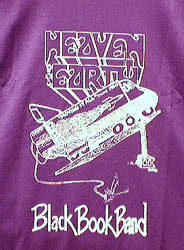 Original "BBB rocket" graphic by K-Mac on the front, complete tour itinerary on the back (including the notorious cancelled dates). This is the tour that produced the "First Contact" live album. White print on heavy-weight black 50/50 tee. Sizes as listed. 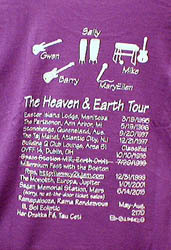 The "Heaven & Earth" tour t-shirt was produced especially for the Black Book Band's reunion appearance as Guest of Honor for Ohio Valley Filk Fest XIV (1998) and, prior to this, was sold only at the con. These are the last of that one-time-only print run. Front has an original graphic by The Bear (Barry Childs-Helton), the back the most optimistic itinerary ever assembled by a band with no paid roadies. Heavy-weight 50/50 tee. Close-out. Colors and sizes as listed. Recorded live in multitrack digital stereo by Dodeka's Bill Roper during the 1993-94 "Brain Weasels" tour. Includes "Moondance," the BBB's signature closer "Hope Eyrie," the found-filk medley "Madman on the Watchtower," a hard-edged cover of Bruce Cockburn's "If I Had A Rocket Launcher," and those great Barry Childs-Helton originals. Autographed by 2/5 of the band (K-Mac and Gwen Zak). Visit The Infinite Attic, our new eBay store. Next weekday shipment on all orders paid though PayPal. Delivery Confirmation on every US order. BIRCH BEER No, I don't sell birch beer. I do drink it, however, when I can find it, and . If you're looking to acquire some, I recommend Briar's Pure Cane Sugar Red Birch Beer, which can be had from World Market.